So … you want to be an architect? After looking at it I think that it also can be applied (with some obfuscation) to the life of an IT architect/engineer – sad, really. WordPress to replace Microsoft Live Spaces blogging – The H Open Source: News and Features. I don’t normally blog about non Lotus related items, but this one is interesting. This blog is hosted on WordPress.com and I really like the service. I don’t have as much freedom as if I were to host WordPress myself (or via another Worpress.org hosting partner) but this way I also do not have to worry about anything – a far cry from when I was hosting my blog via my own Domino template based network … this is so much easier. Even if you don’t opt for WordPress.com you should seriously look into WordPress.org for the technology ans host on one of their partner hosting companies … the technology is mature, easy to understand and just . plain . works. I feel; bad for all those Microsoft Live Spaces clients – I decided to give MS the boot once they shut down Microsoft Money (my main accounting package for many years) without much a notification – I did not know until I had to re-install because of a PC failure and then was left high and dry for a while. so much for staying in touch with your registered – and paying – clients. … well you get it. If that single Hawaii blog reader I have sends me a post card with an invite – I am there, brother! I have not been to Rio in years, but I know I have so much to offer. Also, I think Brazilian coffee is among the best in the world and everybody knows daddy likes his coffee – it also helps me speak even faster than normal and I could present more content in the same amount of time. A clear win-win situation for all involved. Me and Nelson, we could seriously tear it up there. No more needs to be said. Present at (a? the?) Australia LUG that is scheduled to coincide with a Rugby Game between Australia and New Zealand. Incorporate Rugby sports and philosophy into the presentation of effective end user administration. End presentation with several pints of Fosters and maybe a Koala or two dancing on the screen. Clearly, I am the first to come up with that idea and it should be explored further. Be invited to present at the Czeck LUG that will be held at Czesky Budejovice. . My topic would probably be how to improve Lotus Connections deployments with the help of Budvar – a sure winner in my mind. Anything and everything works better when consuming some of the world’s best beer and it helps take the pain away from dealing with CA’s SiteMinder product. SSO at it’s worst . . . . . This one is easy – my paternal grandmother was from Moissac and supposedly there is a handbag of hers still somewhere there int he municipal lost-and-found center that I could lick up. Also, it is some of the most beautiful country in France and has good food and nice people (after all, Grandma was from there) – we could then make part two of the LUG happen at Toulouse … just an idea. Well, here you have it – my top LUG wishes. Now all we need is the power of social media and Santa Claus to make these wishes come true. Aaahh – my favorite comfort food. that is a hard one, isn’t it? But it does make your mind wander and brings back great memories all connected to one thing: food. 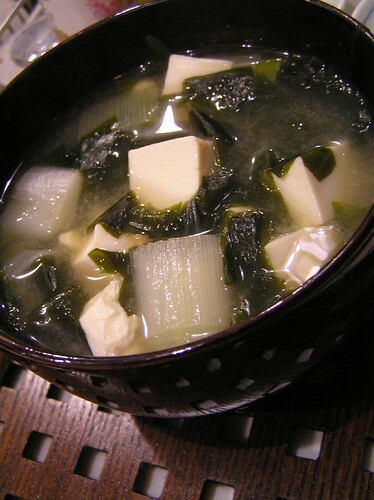 For all those who don’t know what that is – it’s Japanese and in the literal translation means “Port Soup”. It is made with pork, vegetables and miso paste as the base. I remember being dead sick while living in Japan once and being home from work for a week. I had little food in the apartment and was just not well enough to go out to the grocery store. The wife of a good friend took pity and with her two little daughters came by to bring me some food and one of the things she brought me was a big ol’ pot of Tonjiru ….. I ate that and some rice for the ext 3 days while I was getting better. Still brings back memories of warm comfort. I still eat it from time to time now, it is my version of Chicken Soup for the soul. Going through the new blog posts I follow, I came across Volker Webers post here about the Old Spice commercials. I had to immediately go out and create a new phone answering message for myself. Go ahead and listen – I think I seriously man-rock! "Say what you do, do what you say"
So, what do techies do on Christmas day? Something technical, hence the word “techie”. Get up in the morning, make yourself presentable because mom will look at that beard stubble with that look you so well know …. real gentlemen, after all, don’t appear unshaven in public. Make coffee for all (who drink it) and then make sure all the Christmas Cards and presents are under the tree and ready. The son wants his new Blackberry, so you gotta steel his phone while he is in the bathroom and take out the SIM card. The daughter is easy, nothing for now, just an IOU that promises to pay for all ballet auditions and necessary stays overnight .. and somehow that promise for the tickets to Broadway’s “Billy Elliott” got scribbled in there. Gee, that handwriting looks an awful lot like .. yeah, her handwriting for sure. The Empress is not up yet, so off into the daughter’s room where we stashed the loot that was for her. Grandma is simple, that has all been under the tree for a while, she does not peak out of turn like the rest. Opening and all that stuff to “Classic Christmas songs” – Nat King Cole, Bing Crosby, Frank, Dean, Roy … just like I like it. Then, right after the Empress decides it is time to start the cooking – the Techie might mention something about “work … a self employed guy never has vacation … grumble, grumble, grumble …” and off to the home office by way of the cookie platter. There is a new CentOS VMWare server to set up and we need to get DB2 going by this afternoon for a new Lotus Connection install. I also have to make enough room for the new Sametime 8.5 environment I will be building later this week. Maybe the techie is also editing an article for an on-line publication, something like the UCView perhaps? Yeah, that needs to be done as well – especialy since he thingks he has been on drugs when he first handed it in, it is awful and needs allot of re-writing. But before that .. wine, cousins coming over, alllllot of finger food and .. well, that CentOS serve is only half done, I guess it will have to wait. After all, a good glass of red wine can be way more important that a VMWare server. A techie’s Christmas can change at a moments notice I guess. Not that I would know from first person experience, but I have heard, it can transform ….